Okay, it’s official. 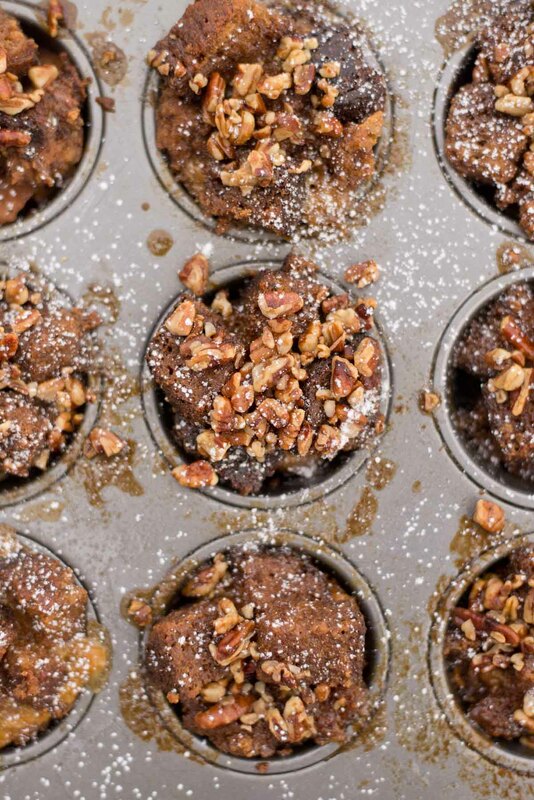 These banana bread french toast cups may be just as good as waking to a special present just for you on Christmas day. Okay, maybe not quite that great, but it is up there. I have fond memories of waking up Christmas morning to the pure excitement of present opening in pajamas, uncombed hair and the smell of a delicious and extra-special breakfast. 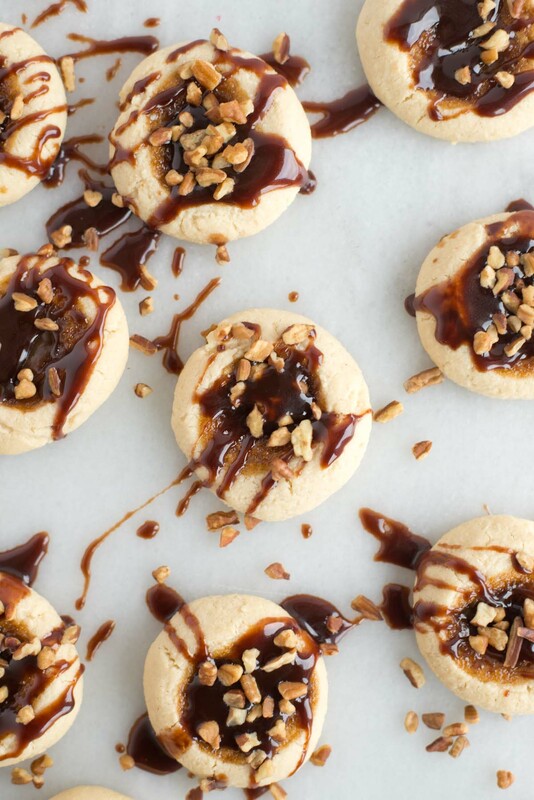 While I don’t typically focus on the food at every occasion (okay that’s mostly a lie) I really think it is a key component of happiness in life. While there is not greater day on earth than Christmas morning, well food obviously needs to be a part of that. While our Christmas breakfast wasn’t what you would call healthy, it was special and it is something I look forward to every Christmas morning to this date. While I would love to have my mom cooking breakfast (she’s transferred to lunch duties) it now falls on my plate (and yes I let my parents enjoy it as well – I’m a good girl don’t worry). So the planning, recipe development and testing has been accomplished. I think I’ve settled on a few new favorites and need I say healthified breakfast treats. 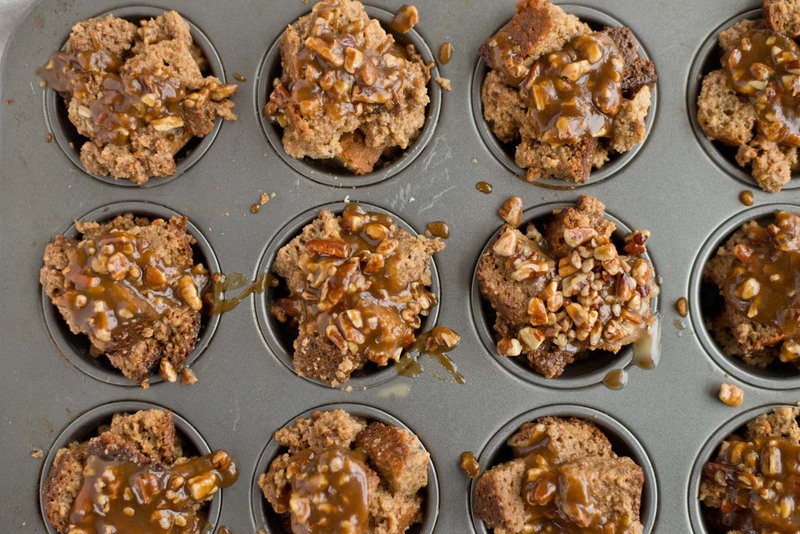 Insert these banana bread french toast cups. 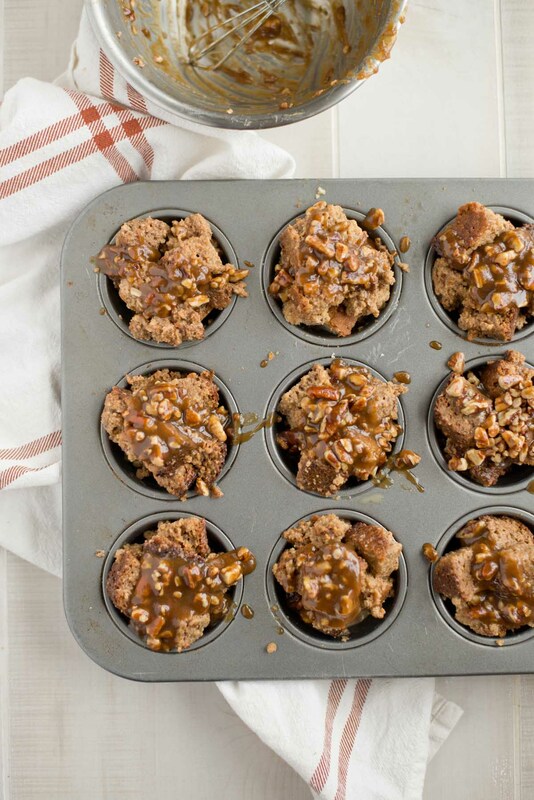 The thing about these french toast cups is the flavor. Don’t get me wrong, typical french toast made with plain bread is good but when you add banana bread… HEEEELLLLO! It takes french toast to a new level and to make it fun, exciting, something different and secretly something you don’t have to stand by the stove all morning slaving over. We’ve made them into these perfectly quaint and cute cups. 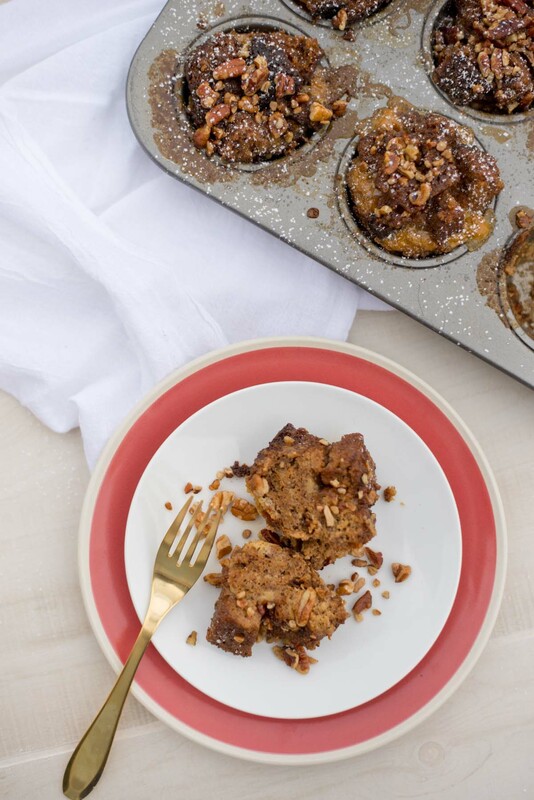 Basically we could call this thing banana bread french toast casserole… if you didn’t want to bake it in muffin tins. But the muffin tin, it allows for that perfectly crispy crust to make its way around every serving. Instead of fighting over the outside edges just use a muffin tin, it will save you what I’m sure would have been the only heated Christmas day debate… because all families everywhere get along perfectly on Christmas day. I say this as I vividly remember melt-down after melt-down after melt-down at our house last year. Who’s to blame them, the feeling when all the presents have been opened and Christmas has almost come to and end is a rough feeling. The “it’s over syndrome” is rough. I still get that and I’m what most would call an adult, I suppose (a young one though I may add). So this Christmas morning, brew a hot cup of joe or better yet a hot frosty (coming soon) or even a warm cup of Fat-Burning Spiced Christmas Tea, watch the present opening, laughter and pure joy and pull this beautiful pan of hot banana bread french toast cups out of the oven. As usual just in time to save Christmas as nearly everyone has just about hit the point of no return, that is when it comes to hunger. 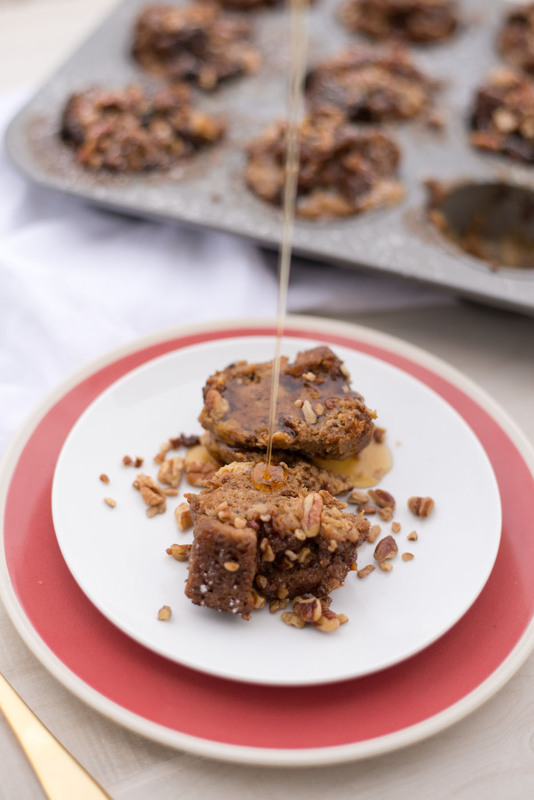 So ladies and gents I have for you the perfect, make ahead banana bread french toast cups, loaded with flavor and drizzled with a sticky pecan sauce. This is Christmas morning. 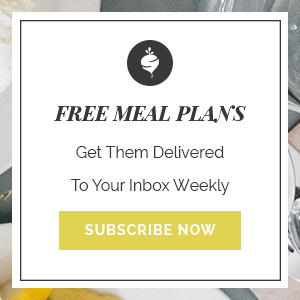 Put it on your check-list, and make sure you cook a double batch of banana bread, one for french toast and one just to eat in the meantime. Plan a birthday party for our middle whose birthday is directly after Christmas -> We can all feel bad for her and everyone else who’s Birthday falls near Christmas. Work on my extra-special surprise for YOU! I’ll end it there so I don’t stress you out with my heft to-do list. Luckily there is t-minus 8 days… t-minus 8 days. I’m just sweating bullets over here, don’t mind me. Well I’m off to start working on my to-do’s. Now you, get busy too. Don’t worry, that surprise for you is at the top of my list… I just wanted to sneak it in and see if you noticed! You have to check back next week to see what it is! Cube banana bread into 1 inch slices. Whisk eggs in a bowl and whisk in vanilla, cinnamon, and nutmeg. Place cubed banana bread into a large bowl and add egg an milk mixture. Let soak for 10-15 minutes. 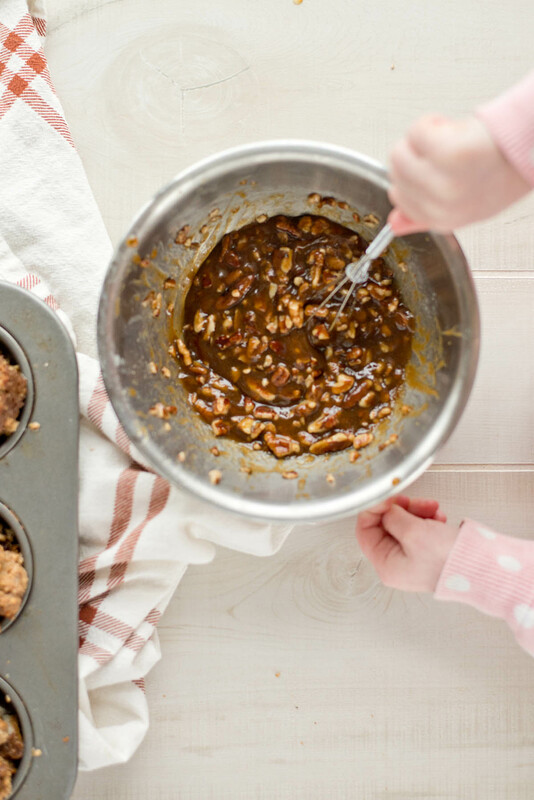 Meanwhile mix together in a small bowl, melted butter, coconut sugar, maple syrup, cinnamon, nutmeg and pecans. Place soaked cubed banana bread into muffin tins (should have enough for all 12 and they may be heaping). Bake for 30-35 minutes or until browned on top and cooked through.